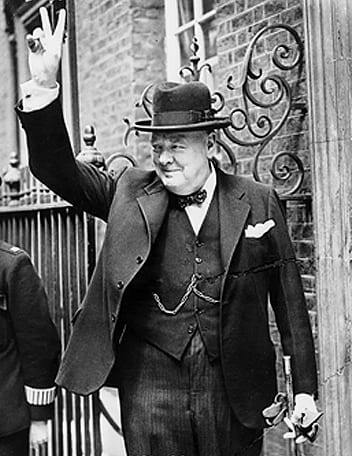 On July 18, 1941, BBC radio host Col. V. Britton broadcast a special message from Prime Minister Winston Churchill to the occupied countries of Europe: “The V sign is the symbol of the unconquerable will of the occupied territories and a portent of the fate awaiting Nazi tyranny. So long as the peoples continue to refuse all collaboration with the invader it is sure that his cause will perish and that Europe will be liberated.” Thus was launched the “V for Victory” campaign, the most successful propaganda campaign in history. Not long after the July broadcast, an observation was made that the Morse telegraphic code for V was three dots and a dash (. . . —) which was also the beat of the opening notes of Beethoven’s Fifth Symphony. That passage was promptly put to a variety of propaganda uses, including the theme song for Britton’s program. Churchill began flashing the V sign with his index and middle finger, palm out, doing it so often that it essentially became his signature. The campaign, to use modern terminology, soon went viral. The Morse code beat proved particularly versatile. People could pound it out with their feet, clap it with their hands, tap it out at work, school, restaurants – everywhere. And, since V was also the first letter of the German word for victory – viktoria – there was nothing the furious Nazi propaganda minister Josef Goebbels could do to stop it. He paid the campaign the ultimate compliment by trying to usurp it – claiming that because the campaign used the notes from a symphony written by a German composer, it supported German victory. Didn’t work. Even though still neutral, it caught on in the United States. As early as August 1941, envelopes appeared with “V for Victory” and the Morse code V printed on them. Posters, stamps, and other ephemera followed. The New York-based British American Ambulance Corps noted, “Never before in the world’s history has an inspiration like the ‘V for Victory’ idea been so universally accepted by freemen the world over.” Initially American use expressed support for England. After America entered the war, the campaign was officially made a part of the government’s efforts. The campaign even lent its name to a new class of correspondence: V-mail, or “V . . . — MAIL,” as it was printed on the stationery. Essentially Eastman Kodak’s library microfilm system adapted for military use, V-mail was a photograph of a one-page sheet of special V-mail stationery reduced to 4-¼ inches by 5-¼ inches. 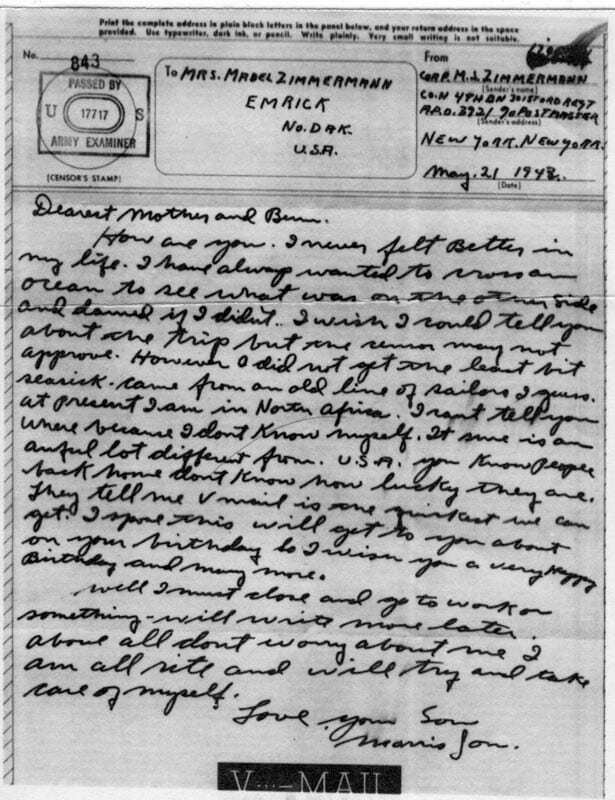 By April 1944, 63 million V-mail letters a month were being shipped to military personnel around the world.